A pedestrian crosses the north side of Anaheim Street above the 710 Freeway. Photo by Brian Addison. When 30-year-old Tess Rothstein was forced to ride a section of street that lacked an unprotected bike lane in San Francisco, she was killed by the driver of an oncoming truck just feet before reaching the area which separated bikes and cars on Howard Street. Within a week, the San Francisco Municipal Transportation Agency removed part of the parking along Howard Street to extend the protected bike lane. Just months after 68-year-old resident and local advocate Robert Bennett was killed by the driver of a car at 23rd Street and Harrison Street in Oakland, the city’s Department of Transportation immediately altered the intersection to be more amenable toward pedestrians, especially older citizens who need more time to cross streets. So why, after two deaths—one of a bicyclist on January 3 and one of a pedestrian, critically injured last Thursday, April 11, and succumbing to their wounds later—has nothing been addressed about these handful of bridges that provide the sole access to and from West Long Beach? Major arterials like Anaheim Street, Pacific Coast Highway, Willow Street, and more are the only ways for pedestrians and bikes to bounce back and forth between West Long Beach and the rest of the city—and they’re incredibly dangerous already. I shot the video above two years ago while exploring the stretch of Anaheim Street by bike as it traverses over the 710 Freeway and Los Angeles River—and it taught me a lot after visiting these bridges. Small sidewalks, buffered by nothing, line the lanes which are used as mini-speedways for vehicles and trucks. Riding a bike, leaving most to ride the sidewalk given the lack of a protected bike lane, becomes a balancing act of epic proportions: Between your heightened stature above a lowly guard rail and the constant swoosh of passing by trucks, vans, and cars, one can easily be blown off the side. Just last year, the issue of pedestrian safety, specifically on Willow Street, came up again: Cabrillo High School’s community page originally shared a parent’s frightening video of the way in which kid and adult pedestrians risk their lives should they slip while crossing Willow Street over the 710 Freeway. This video was shot on the south side of Willow Street heading west, an area of the arterial that faces two particularly dangerous points for pedestrians. On one hand, as the video shows, an absence of guard rails means one minor slip could send you into the traffic of the 710. On the other hand, the creation of a lane solely for people entering or exiting the freeways with no lights for their safety. In the trek of someone walking east (from the left in the image) on the south side of Willow, they have: 1) to get across Fashion Avenue with no light; 2) face cars on Willow Street wanting to enter the southbound 710 entrance; 3) face cars immediately exiting the southern route of the freeway, who are merging with drivers on Willow Street also merging to get onto the northbound entrance of the 710—all without crosswalk lights; 4) and finally face more cars exiting the northbound route of the freeway, also with no light. The future plans for the 710 Freeway don’t help matters: Though the expansion itself has been put on hold, the supposed “community benefits” attached to the project—largely capital improvements along the many roads and arterials that run along and over the freeway—will be moving forward. Those “improvements” include the installation of complex and dangerous diamond intersections along Anaheim Street, Pacific Coast Highway, Willow Street, and Del Amo Boulevard. 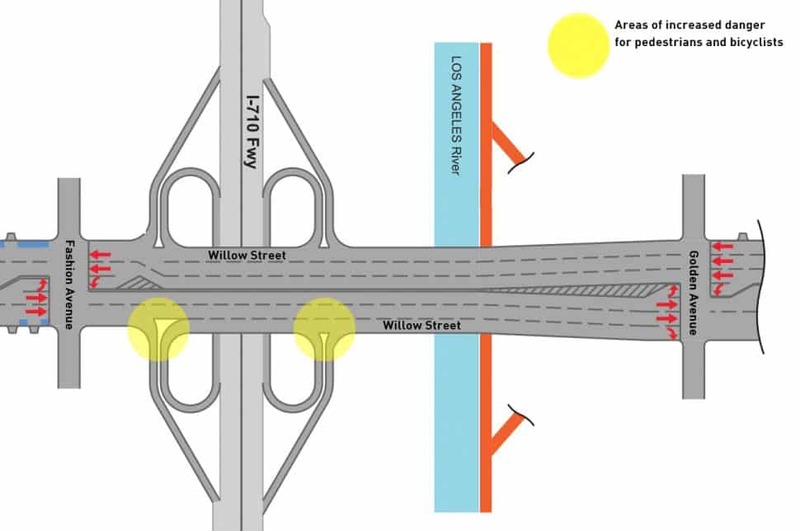 The perilousness of these intersections did not escape notice by the city’s Department of Public Works, which responded to Caltrans when the EIR was released that it was against the proposed diamond intersections. The city is still awaiting its response from Caltrans, according to Carey. On top of that, though the city is contracted by Caltrans to maintain the striping along Willow Street, they are unable to unilaterally paint a bike lane on the road and have to face a “cumbersome process” through Caltrans channels in order to achieve such a goal, according Carey.